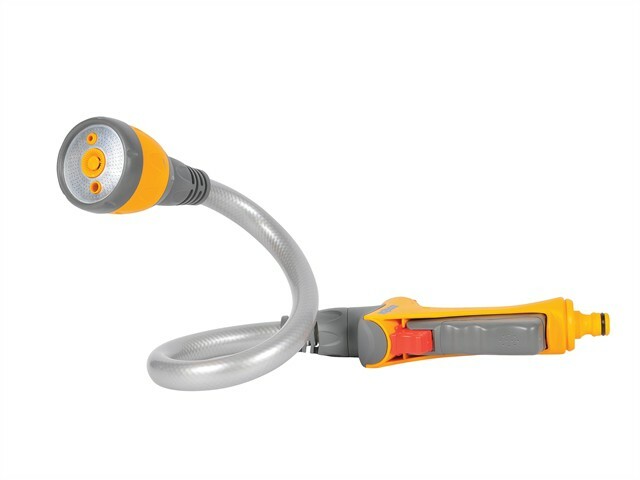 The Hozelock 2683 Flexi Spray Gun is an exciting, innovative multi-purpose hose end attachment designed to be moulded into an array of shapes to perform a wide range of watering functions. As a long reach spray gun: easily water pots, containers and boarders with minimal effort and water wastage. For watering hanging baskets, extend your reach by 60cm to water hard to reach areas. Can also be used as a sprinkler, water the lawn with ease by creating a wide area sprinkler capable of covering up to 69m². For the occasion when a specific plant or area needs a good watering, the Flexi Spray can be conveniently moulded and left to water on its own.With a flow control and 3 stage trigger that provides complete control of water delivery, minimising water wastage. Four spray patterns: Jet for high power cleaning, Fast Fill for filling buckets and watering cans, High definition Metal Rose for gentle watering and Sprinkler for wide area watering. WINNER of the prestigious RHS Chelsea Flower Show 'Product of the Year' 2013.